This 1,572-word white paper was written by Verblio writer Dylan L. — who specializes in deep tissue marketing content across industry channels. This piece is a bottom-of-the-funnel white paper used to help add value to prospects at the end of the pipeline (or in the reverse funnel). For many businesses, finding a way to create a marketing skeleton that penetrates deep into the customer lifecycle can be difficult. Dylan L. has the “in-depth mindset” and research capabilities to help brands create full-funnel content that remains useful at every stage in the buyer’s journey. White papers like this can be the perfect marketing tool for pipeline optimization and post-acquisition branding and loyalty building. Businesses could use this value-driven content piece to build relationships with other metals manufacturers (e.g., LinkedIn, conferences, website, etc). This white paper could also be used to build email lists or push customers through the reverse funnel (e.g., build loyalty, provide value, enhance word-of-mouth, etc). Verblio’s extensive list of content types gives brands and agencies the tools and resources to develop a content strategy that’s useful across campaigns—and the expert writers to help them craft those pieces down to the granular details. The metals space is set for a digital disruption. As the industry continues to face capacity utilization issues, complex economic times, and the digitization of critical components to the industrialized value chain, there’s a sense of uncertainty for the industry as a whole. Not only has modern economics disrupted commodity demands and unsynced price patterns, but emerging technologies are also reshaping the supply chain, cutting away at profits, and demanding new methods of distribution, connectivity, and productivity. The metals industry exists in the frictions between new and old, and the complete reshaping of the industry is going to fracture existing architectures and introduce new landscapes that will redefine processes. Understanding how to stay agile and profitable in an environment where short term pressures and global trade inconsistencies force operational changes is mission-critical for metal businesses that want to stay competitive in a radically changing market. Here’s a look at how digitization will impact the metals industry. Coined Industry 4.0, the evolution of metals is on the horizon, and failing to adapt, evolve, and overcome the barriers of the digital world will leave businesses outpaced by their competitors. For years, the metals industry has been cautious of digital adoption. Not only do commodity-based businesses feel sheltered from the digital wave, but reshaping an industry that’s been solidified as deeply as the metals industry is complicated. The distribution and production value chain has many unique players, and each of them faces their own challenges in the digital space. Industry 4.0 is a term for the upcoming digital disruptions in the metals industry, and how the industry will evolve to meet these changes. To really understand how deep digitization will fracture and reform the metals industry, it’s better to think of Industry 4.0 as a framework that’s layered on top of the distribution and production value chain, which encompasses miners, distributors, producers, fabricators, etc. This means that Industry 4.0 is both the actual digital technologies that will drive changes in the industry and the new methods of dealing with these shifts in the market. These changes will reduce costs, improve operational efficiencies, strengthen supply chains, and introduce opportunities across the industry. In particular, Industry 4.0 introduces opportunity in three unique spaces: environmental sustainability, customer-centricity, and business models. As environmental regulations continue to compound, finding a way to reduce emissions and replace supply chain practices to supplement those changes is an uphill battle for many steel companies. In Europe and Canada, CO2 taxes can eat away at profits, and in the United States, ambient air quality rules are impacting steel and mining companies yearly. To amplify the situation, Chinese steel companies don’t face the same stringent environmental regulations, which leaves them in a more favorable condition. For steel producers and distributors, these changes require digital anticipation. How businesses deal with these growing concerns will dictate their ability to remain competitive in a changing market. Digitization methods are already emerging to deal with these constraints. Some producers are turning towards a circular economy, where technologies can help them turn recycled goods into products. Others are leveraging IoT sensors and machine learning to link systems, automate processes, and reduce redundancies to cut costs. The digitization of the metals industry provides multiple pathways to adjust to these changes—including using environmentalism to your favor by making waste reduction a core component of your value proposition. Digitization promises to tackle the environmental issues facing the industry. 3D printing, automation, environmental analytics, improved resource nationalism, and supply chain changes give metal players the fluidity they need to adjust to growing customer concerns around reusability, recycling, and sustainability. Introducing change in any industry is hinged to customer expectations. Digital technology gives businesses the ability to create deeper, more meaningful customer dialogue, that they can ultimately use to drive business-wide changes. Whether this is online portals, behavioral data, or even simply connectivity, finding a way to improve customer-centricity is critical in the current ecosystem of metals. There are three ways metal producers can become customer-centric. Value: Businesses that create value-driven customer-centricity will leverage digital innovations to reduce customer pain points and increase the customer experience. This requires a combination of digital technology that can monitor and predict issues as well as a combination of critical teams—marketing, sales management, and R&D. By giving customers a constant communication channel to specialized teams and technology that provides them with information and real-time production costs and delays, businesses can improve the customer experience, and their value, in turn. Supply Chain: Businesses that utilize digital technology to improving and streamlining their supply chain will be able to offer customers more mission-critical solutions. By leveraging real-time supply tracking with robust global supply chains, these suppliers will be able to quickly move products by utilizing cost-saving robotics and IoT sensors, while offsetting environmental costs by spreading their responsibilities across their supply chain. Cost: Businesses that utilize digital technology to reduce costs will attempt to drive sales and capture high capacity utilization. To do this, businesses will need to utilize a variety of digital technologies to remain lean and commodity-driven. This includes IoT sensors to streamline productivity, predictive analytics to mitigate risks, robotics to reduce human touch points, and the use of bid data to develop more robust relationships. Ideally, savvy businesses will leverage all three forms of customer-centricity to remain competitive. As the power dynamic shifts towards the customer, finding a way to improve relationships and offer value above and beyond your competition will be crucial moving forward. Digital technologies are also paving the way for disruptive and imaginative business models. These models exist to anticipate changes in the current metals ecosystem and introduce profound systematic changes in supply chain distribution and production. Circular Economy: To combat rising environmental pressures, reduce costs, and improve image, some metals businesses are introducing circular economies . Although adoption is slow and supply chain issues are still present, the circular economy model can help businesses stay environmentally friendly where possible. To do this, metal players are utilizing technologies like m-IoT  for mineral processing, categorization, and information. Servitization: Another growth vertical for the metals industry is in servitization. By offering services along with products, businesses can achieve long-term growth, provide additional revenue streams, and improve customer relationships. In fact, 74% of metals manufacturers that do offer servitization say that increased customer relationships are their driving motivator . Of course, leveraging a service requires significant investments in technology (i.e., enterprise solutions, IoT, machine learning, etc. ), people, and infrastructure. Individualization: The rich data streams, predictive analytics, and cost-cutting solutions that Industry 4.0 offers have made individualization a viable option for many manufacturers . Individualization is the process of creating hyper-granular products for specific customers in small batches. For individualization to be profitable, businesses need to leverage predictive data and robotics. Each batch must be self-designed and configured without any human touch points, and the products must be near-perfect in quality. Disintermediation: With these new digital technologies, it’s possible for specific elements of the value chain to disrupt the chain and distribute goods directly to customers. This process is known as disintermediation. Not only does disintermediation combat price arbitrage, but it delivers a more robust and complete customer experience. 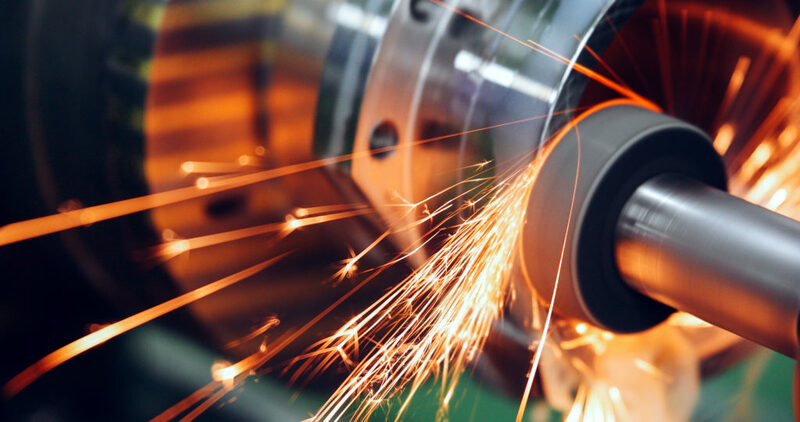 Industry 4.0 introduces profound changes to the metals industry that help alleviate concerns over environmentalism, price fluctuations, shrinking capacity utilization, and ongoing global trade issues. The metals industry is undergoing an evolution, and digital solutions will introduce profound changes across the value chain. While all of these new technologies may seem like they challenge the core IT infrastructure of the metals industry, a complete reworking of IT isn’t necessary to introduce these changes. Most metals businesses rely on a mixed architecture of legacy systems, but promising parallel solutions reduce some of the cost frictions around immediate adoption. AI: Data is the most significant drivers of digitization in the industry. Analytics promise to reduce risks, increase up-times, and help optimize recipes for new products and grades. This includes optimizations across the value chain. Feedstock costs can be reduced by raw material analytics; sales can be reshaped using behavioral data, and spend data can be utilized to forecast price predictions. Each player in the supply chain can profoundly benefit from AI. IoT: Another significant growth vertical is the use of sensors, mobile devices, and cloud technologies, which can help with predictive maintenance and connectivity. Pumps, motors, and other mission-critical equipment can be immediately identified when issues arise, and sensors can ensure that optimal temperatures and routines are upheld. Robotics: Automating processes and reducing human touchpoints will lead to better margins and reduced redundancies across the value chain. The metals space is changing, and finding a way to adopt these new technologies in a logical, streamlined manner is critical for the industry. So far, metals players have utilized specific technologies and applied them to granular use cases, but industry-wide changes are imminent. Investing in infrastructure is a start, but the industry as a whole needs to think critically about the entire ecosystem and how to adapt to the pressures of these changes. Is your company ready to meet these new challenges head-on? Are you prepared to introduce changes that will significantly impact your bottom line, simplify your processes, and change the value dynamic of your business? Contact us to learn how you can stay dominant in a shifting industry.